Rancho Jacona is the perfect home for a multi-day northern New Mexico adventure. An hour drive in any direction puts you in some of the most beautiful country New Mexico has to offer. But even a 10-minute walk from Rancho Jacona will have you pulling out your camera to capture the scenery. Here is our take on the perfect way to enjoy five days at Rancho Jacona. Start your perfect stretch of days with breakfast made with eggs from the Rancho Jacona hens. When the chickens are cooperating and eggs are available we are happy to share them, straight from the hen house. If you have never had truly fresh eggs, the flavor will be a very welcome eye-opener. Next, venture out to the Tent Rocks National Monument, about 40 miles south of Santa Fe. 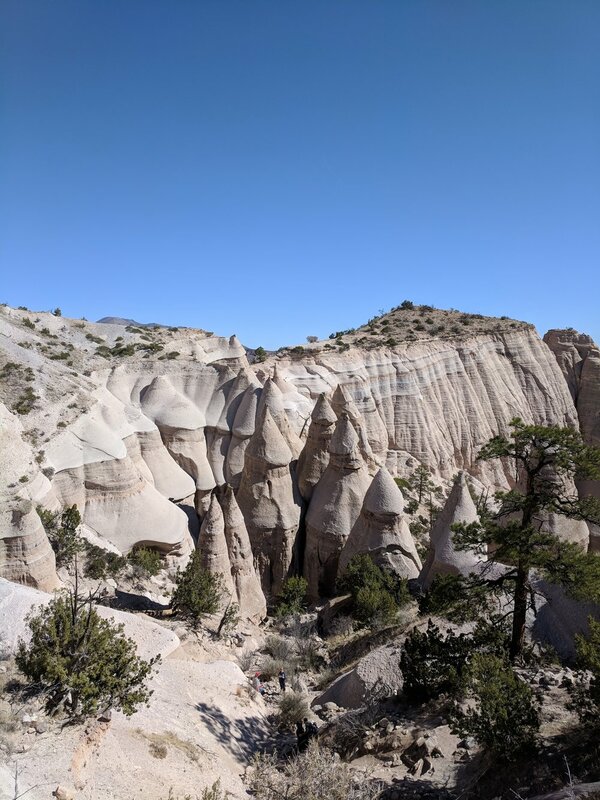 Tent Rocks features a moderate 1.5 mile out-and-back hike that ends with one of the more perfect 360-degree views in northern New Mexico. The uphill climb is well worth the effort. If you've never squeezed through a slot canyon or been up close to a hoodoo, this is the place for you. Don't forget your camera, your sunscreen, or your water bottle! 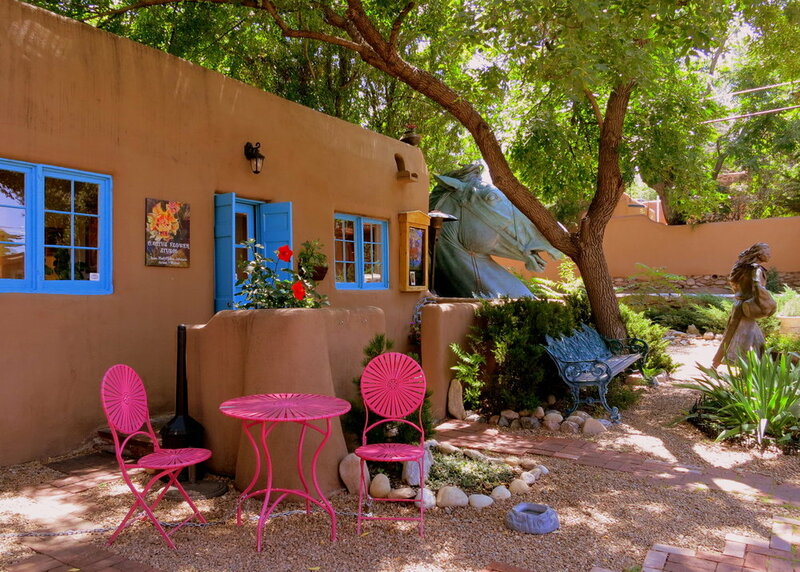 After your Tent Rocks adventure, head to Santa Fe for an amazing cup of tea and a sandwich at the Teahouse on Canyon Road. On a sunny New Mexico day, the outdoor seating is one of our favorite spots. After you've rested your legs and satisfied your appetite, stroll through some of the 100 art galleries featured in just a half mile stretch of Canyon Road. Even if you don't find something to take home with you, you will definitely leave inspired. Head back to Rancho Jacona for a late afternoon siesta by the pool. The perfect spot to cool off, recharge your batteries, and catch up on that book you've been meaning to read. 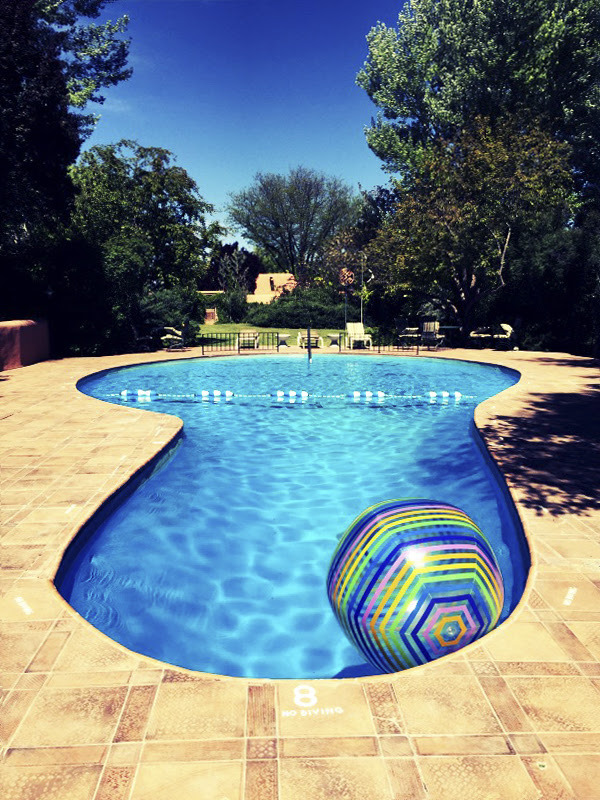 Our pool is open May-September. In cooler weather, grab a blanket and enjoy a nap in one of our lounge chairs under the cottonwood trees. Finish your first day with dinner at one of our favorite local spots, El Nido in nearby Tesuque. An 18-minute drive from Jacona, and a worthwhile treat. After dinner, head back to your casita and dream about tomorrow's adventures. After breakfast, start day two with one of our favorite local hikes, at Tsankawi. In the 1400's Tsankawi was home to the Ancestral Tewa Pueblo people. Today, their descendants live in the nearby San Ildefonso Pueblo. Part of the Bandelier National Monument, the main trail head at Tsankawi is less than 15 minutes from Rancho Jacona. In just a two-mile hike you will see cliff dwellings, petroglyphs, and some unbeatable views of the high country. After your hike, head north on Highway 30. Your destination for the afternoon is Ojo Caliente. 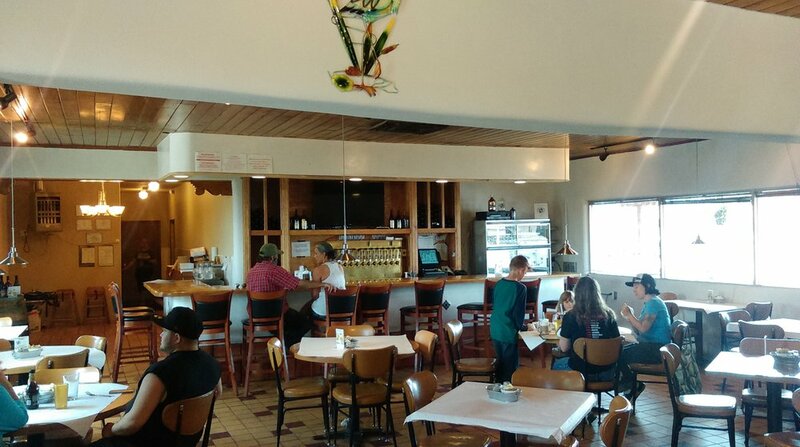 Your first stop is the quirky, lovable Mesa Vista Cafe. Grab a quick burrito or an order of huevos rancheros. Next, head next door to the the famed Ojo Caliente Hot Springs. The perfect place to soak in the mineral-rich waters of northern New Mexico, while also rejuvenating your skin with a long mud bath. Famous for its reported restorative properties, the mud at Ojo Caliente will make you feel like a kid again. Be sure to book spa treatments in advance. The bar at Ojo Caliente is a great spot for afternoon refreshments before heading back to Rancho Jacona. Leave Ojo Caliente feeling relaxed and renewed, and head back to Rancho Jacona for dinner in your fully-furnished kitchen, and a quiet fire in your built-in kiva fireplace. You can also enjoy our outdoor fire pit while gazing at the star-filled New Mexican skies. Rancho Jacona abounds with outdoor living space. Day three is all about Santa Fe. Start your day with a delicious breakfast at the Plaza Cafe. From there, head over for a truly unique experience at Meow Wolf. Part art exhibit, part museum, part fun house, Meow Wolf will keep you guessing at every turn. Note, Meow Wolf is closed on Tuesdays. For lunch, it's hard to beat Opuntia in the Railyard district, or the ceviche at the Coyote Cafe rooftop cantina. For a unique architectural experience, the Loretto Chapel is a must-see. Home to the "Miraculous Stair," the chapel is a cultural phenomenon that has been featured in a variety of TV shows, books, and tours. From there, treat yourself to a bubbly afternoon stop at the Gruet Tasting Room next to the historic Hotel Saint Francis, on Don Gaspar Avenue. Their award-winning New Mexican-produced sparkling wines will have you planning how to pack a case for the trip home. Wrap up your day with a stroll through the shops surrounding the historic Santa Fe Plaza. In summer and early fall, an eclectic lineup of the area's favorite bands turns the plaza into a raucous performance space. While in the center of town, be sure to check out the beautiful Native American jewelry, which local artisans display at the Palace of the Governors. Before heading back to Rancho Jacona, stop in for dinner at any one of the dozens of highly-rated restaurants in the heart of town. Some of our favorites include The Shed, Restaurant 315, Andiamo, Radish & Rye, and Paper Dosa. Even if the crowing roosters in the distance encourage you to do otherwise, let yourself sleep late on Day Four. Elect someone in your group to take a short drive into the village of Pojoaque to pick up breakfast burritos at El Parasol. After breakfast, take a walk around our beautiful 35 acres. Enjoy the expressive goats and sheep. Feed leftover produce scraps to our grateful rabbits. Watch out for your fingers and be sure to bring your camera! In the late morning head north to Abiquiu for a day of exploring the area that inspired legendary painter Georgia O'Keeffe. Stop in at the new O'Keeffe Welcome Center, beautifully constructed next to the Abiquiu Inn on Highway 84. Pick up a book or souvenir and get some advice about where to go exploring from the very knowledgeable and helpful staff. Pick up a snack at Bode's, billed as "The Oldest General Store in New Mexico." Take time for a hike at beautiful Ghost Ranch or drive out along the Chama River to the peaceful Benedictine Monastery of Christ in the Desert on Forest Road 151. The Benedictines primarily live in silence, though visitors are welcome in the gorgeous chapel and gift shop. The quiet beauty of the place is astounding. On the way back to Rancho Jacona, stop in Espanola for a pizza and a delicious micro brew at the Blue Heron Brewery. Day Five includes a trip west to Los Alamos. A short 15-minute drive west on Highway 502 from Rancho Jacona will have you in the center of the birthplace of the atomic bomb. Los Alamos is also a place of ancient village sites, spectacular scenery, diverse wildlife, uncommon high-altitude recreational opportunities, small-town friendliness, and world-changing technology development. Stop in at the Bradbury Science Museum to get a window into the history of the National Laboratory which operates in Los Alamos. Two 16-minute films shown throughout the day tell the stories of the race to build the first atomic bomb during the Manhattan Project and the work the Lab does today. TechLab is a hands-on, experiential space geared toward children and families for exploring scientific and technical concepts. As you head back down the hill, take a detour to the town of White Rock for lunch at the Pig + Fig Cafe. Your next stop is the Poeh Cultural Center in Pojoaque. This museum is devoted to the arts and culture of the Puebloan peoples, especially the Tewas in the northern part of the state. Next door is Roxanne Swentzell's Tower Gallery. Roxanne's clay and bronze sculptures have a powerful sense of humor and will delight visitors of all ages. Head back to Rancho Jacona for a rest and then finish your day with a trip to the Four Seasons Rancho Encantado resort near Tesuque. Settle in with a drink while the sun sets and order one of the best burgers you will ever eat from the bar menu. Toast your good fortune at getting to spend five perfect days in the Land of Enchantment. Salud!